Paul Little reminded me that I neglected to mention the Joe Hayashi Memorial in yesterday's post. U.S. Army Staff Sergeant Joe Hayashi demonstrated dauntless courage and exemplary leadership in Italy that enabled his company to obtain its objective before he was mortally wounded. He was presented the Medal of Honor in 2000 posthumously by President Bill Clinton for extraordinary heroism and devotion to duty, in keeping with the highest traditions of military service. The only Pasadena resident to have been awarded the Medal of Honor for service during World War II, he was honored posthumously during a ceremony at Victory Park in August 2008. A permanent memorial commemorating his bravery was unveiled at the event, which was attended by members of his family, city officials and community leaders. Several Japanese American veterans of World War II attended the ceremony as well. 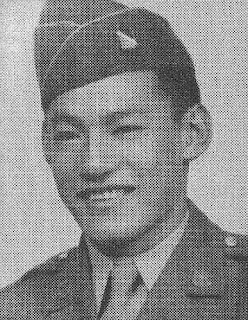 Hayashi was in the U.S. Army's Company K, 442nd Regimental Combat Team. On April 20, 1945, in Tendola, Italy, he skillfully led his men to a point within 75 yards of enemy positions before they were detected and fired upon. After dragging his wounded comrades to safety, he returned and boldly attacked the hill, severely minimizing the enemy threat. On April 22 he continued the attack, firing multiple grenades before being mortally wounded. Hayashi was the son of Chukichi and Toyo Hayashi, now deceased. He is survived by one sister, a half-sister, two half-brothers and numerous nieces, nephews and cousins. Read more detailed information here. Victory Park was dedicated as a living memorial to Americans who made the ultimate sacrifice during World War II. The rose garden at the flagpole is in the shape of a V for Victory. You'll find the Hayashi Memorial there. Thank you for the nod. I followed your link to the Hiyashi biography. It is a good read. He was a true hero. Oh, as a boy he was quite an athlete and apparently hung out with one of the Robinsons. I really appreciate the information on Joe Hayashi. I pass by this park every day and I never fully understood the historical significance of this monument. Thank you for sharing.